Introducing Hard Rock Hotel Hartford, a new-build 170-room property set to open fall 2018 in the Capital City’s fast evolving Downtown North (“DoNo”) neighborhood. Developed in collaboration with Centerplan Companies and managed by Hard Rock International, the hotel will be situated at the meeting of Main and Trumbull Streets. Welcoming locals and visitors alike, Hard Rock Hotel Hartford will serve as a top regional attraction and complement the city’s new minor league stadium, as part of Downtown North’s long-term redevelopment plan. Enter the Hard Rock Hotels Mix Summer Throwdown! Submit your own mix for a chance to DJ at Hard Rock Hotel Ibiza or win prize packs from our Sound of Your Stay Partners: Native Instruments, Blue Microphones, and Blue Mo-Fi Headphones. In its pursuit for excellence, Hard Rock Hotel Vallarta has received, for the third time in a row, the recognition from the American Automobile Association (AAA). The Four Diamonds Award is given to only 5.4 percent of the more than 28,000 hotels approved by AAA worldwide. This award honors the property's consistency and refers to our brand’s success in the important mission to create experiences that rock in the Mexican Pacific. We’re showing you DOUBLE the love in February! Earn DOUBLE points on your in-store Rock Shop® Qualifying Purchases of at least USD$50 from February 1 – February 28, 2015. Offer valid at all Rewards participating Rock Shop® retail stores globally. Orlando, Fla. – Feb. 6, 2013 – Hard Rock International – with hotel locations from Bali to Cancun, San Diego to Singapore and Chicago to Macau – announces plans to open Hard Rock Hotel Palm Springs in Fall 2013, bringing the legendary Hard Rock vibe to one of Southern California’s hottest vacation destinations. Hard Rock International, in collaboration with Kittridge Hotel Management, will transform the former Hotel Zoso into an enviable hotel destination, reflecting the famed Hard Rock brand in a city known for its year-round sunshine, clear skies and endless activities. Orlando, Fla. Jan. 11, 2013 -- Hard Rock International – owner of one of the world’s most recognized, iconic brands – announced today their submittal of an application and a $400,000 non-refundable application fee to the Massachusetts Gaming Commission for the development of HARD ROCK HOTEL & CASINO NEW ENGLAND to be located in West Springfield, Mass., on the campus of Eastern States Exposition (ESE). The single-phased resort property would be created on a dedicated 38-acre area of the ESE’s eastern parcel, as a keystone enhancement to the largest, most popular visitor destination in the region. Fender Guitars and Filter Magazine set up shop in the Hard Rock Hotel Chicago's Angels and Kings Suite on the 36th Floor this year for Lollapalooza. Here's a look at some of the goings on in their suite the day before Lollapalooza lights up Grant Park for three straight days of music festival madness. Can't be in Chicago? Follow us on http://twitter.com/hardrock or watch the livestream on our Facebook page! To check out some videos of these goodies, go to the Hard Rock YouTube channel. 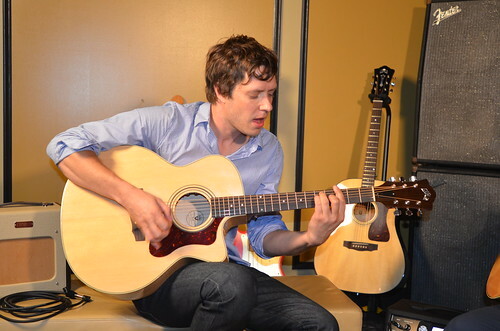 Here's OK GO doing an acoustic performance of their new single All Is Not Lost.